Our Annual Year-End Fundraiser. Please consider making a $10 donation to the network today. 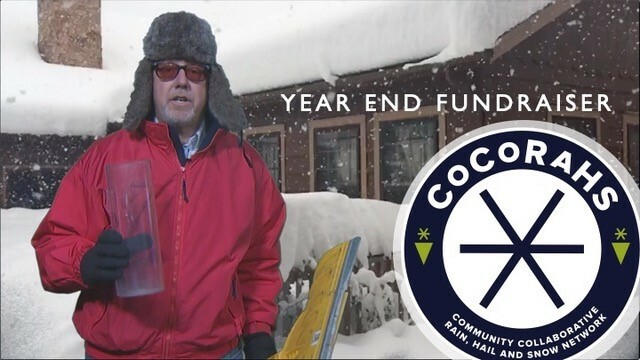 As the end of 2018 approaches, it's time for our annual CoCoRaHS year-end fundraiser. This is a very important event that many of you continue to play a vital role in, and we thank all of you who have given to it in the past. Even more important, we wish to thank each and every one of you who, equipped with a rain gauge, take the time and effort each day to measure precipitation that may have fallen at your location. Often this time of year the weather outside is not fit for man, nor beast, yet you diligently continue to take observations. We have an amazing group of folks from coast to coast, from the Canadian border to the Rio Grande. You are what makes CoCoRaHS the premier precipitation network that it is today. We appreciate you! During the year, we are asked the question, "How can I help the network financially, in addition to taking rain and snowfall measurements?” Donating to these fundraising campaigns is a great way of doing this. Over the years, we've run our traditional "Five for CoCoRaHS" fundraisers and have greatly appreciated your support. This year, due to constraints beyond our control, the minimum donation amount has been raised to $10. Thus the “Ten for CoCoRaHS” title this year. We hope that you will understand and still consider donating. As we have said in the past, each and every one of your gifts, no matter the size, adds up quickly and goes a long way to keeping the project operating throughout the year. As in past years, we have a special gift available to all who make a donation of $55 or more. This year, it’s our new CoCoRaHS Blizzard T-shirt. They're really sharp and will look great on you or a member of your family. A long-sleeved shirt is available for a donation of $100 or more. The shirts will be mailed out in February. If you have a moment, please view our year-end fundraiser video. Contributions to CoCoRaHS may be deductible as charitable contributions within the limits of the Internal Revenue Code. Please consult with your tax professional. You may print a form to complete and mail in by clicking here. Please note that all donations received will go directly to the support of the CoCoRaHS Network and its sustainability. No funds received will go to NOAA's National Weather Service, which is a great advocate of CoCoRaHS. Thanks to all of our 3,235 donors, our goal of $100,000 was reached tonight. It happened with a $55 donation at 7:11PM MST from Pakenham, Ontario, Canada. That one put us over the top and they kept rolling in. As of 9PM MST we're at $102,185. Fantastic! Many thanks to all of you for making this year's fundraiser a a great success. We'll keep the website open for another week and you can check back from time to time an see where we finally wind up when all of the mailed in gifts are counted. Thanks again from CoCoRaHS Headquarters! Today is the final day . . . we are very, very close to our goal! Thanks to all of you who have given to our fundraiser! Today is our final day and as of 7:30AM MST, we are about $6,000 from our goal of $100K. Our fingers are crossed. I think we can do it. We'll post an update later on today. Of course if you are reading this message, you are probably checking our progress right along with many other observers. Thanks for being part of our team! Three days and $11,000 to go! Our latest update has us closing in on the $90,000 mark . . . but that's still 10% away from our goal. It looks like it could be a nail-biter coming down to the wire. Please consider a last minute $10 gift and push us over the finish line! Also remember that there are matching challenge gifts still out there where donors have offered to double your contribution. Good afternoon out there . . . we've had a generous outpouring of year-end gifts today and we are now at $85,000. Thanks so much!! With 6.5 days to go we have a good shot at reaching our $100,000 goal. Have yet to make a donation? You've still got time to qualify for a 2018 tax deduction (of course the deduction depends on how you file). Those $10 gifts sure add up fast. Please consider one today. Wishing everyone a safe countdown to 2019 tonight. 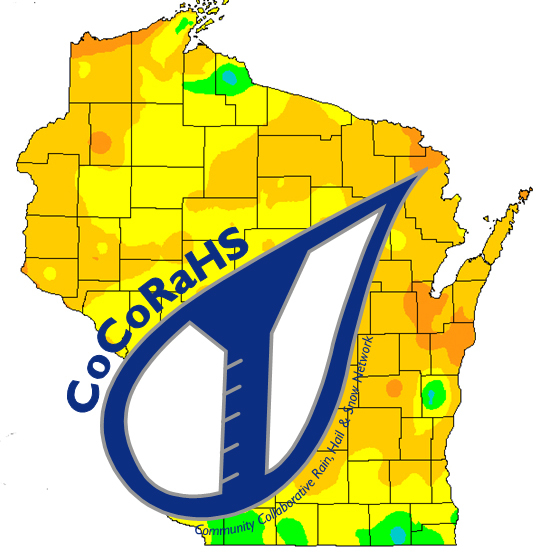 Many thanks to those of you who have already donated to our annual CoCoRaHS Year-End Campaign. Your donations have been very generous and we truly appreciate them. We have a little over $40,000 left to raise in just over two weeks and we are hopefully that we can meet our goal of $100K as we head down the stretch. If you have yet to participate in the campaign, please help us celebrate the Winter Solstice with a $10 donation to CoCoRaHS this Friday, December 21st! One hundred $10 donations on the first day of winter? It's something that we can shoot for indeed. This morning the Badger State has added a matching challenge. A donor from Wisconsin will match up to five donations of $55 from the state of Wisconsin. Let's cheer on our friends from this great state to donate this week and meet this challenge. Our matching challenges double the impact of your gifts. Thanks for all of your donations! We're at $50,767 this morning. Once again thanks so much for your donations over the past 15 days. We are at 47% of the goal. Recently a donor asked, “How many folks from my state have given toward the campaign so far this year?” Well for those of you who are interested, he's the 'top ten' and 'bottom ten' state rankings by number of gifts as of late this morning. We'll post an updtate again later on this month. We wanted to send out a great big thank you to all of you who have donated to this year's fundraiser so far. We are almost half way to our goal. Over $45,500 in donations that have already come in. If you have yet to give and are considering a donation, please make one today. A donor from Indiana will match up to five donations of $200 from Indiana, Illinois, Michigan, Ohio and Kentucky. A donor from Massachusetts will match up to five donations of $55 from Massachusetts. A donor from New Mexico will match up to twenty donations of $150 from any state west of the Mississippi River. A donor from Minnesota will match up to ten donations of $100 from Minnesota, North and South Dakota. Fundraiser off to a great start!! Thanks to everyone who donated on Giving Tuesday . . . our year-end fundraiser is off to a great start! $14,540 raised as of 9AM MST Wednesday. CoCoRaHS officially began on June 17, 1998. With a few observers along Colorado's Front Range, we had no idea that the network would become what it is today, with more than 20,000 active observers in the United States, Canada, Puerto Rico, the U.S. Virgin Islands, and the Bahamas. A truly remarkable effort by all of you. Thank you for your precipitation observations over the years. You are an amazing team of citizen-scientists!